Hapag-Lloyd's MS Europa – when it comes to luxury at sea, this sleek, 408-passenger vessel is as good as it gets. But Ward is not alone in bestowing that accolade. Tom Fielding, author of the highly respected “Fielding’s Guide to Luxury Cruises” agrees, honoring the “Europa” as the only “Six Star Ship of the Year” for an unprecedented third consecutive time, with 95.6 points out of a maximum 100. Even on-line Cruise Critic.com agrees, calling the “Europa” “the industry’s most intriguing – and upscale – cruise ship,” even though she doesn’t rank in the top ten on any of its polls based on traveler-voting. That’s because, those superlative ratings notwithstanding, this paragon of plushness plies the world’s 7 seas 12 months a year under the radar of most English-speaking travelers. 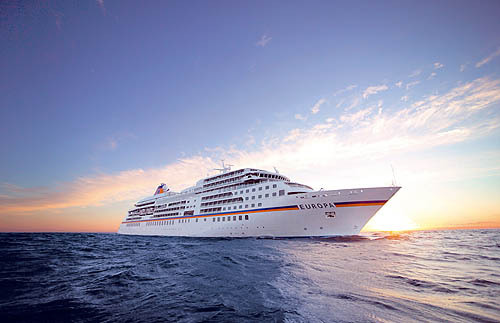 Flag-ship of the 4-vessel cruise fleet run by Hapag-Lloyd, the shipping giant created by the 1970 merger of two 150-year-old German steamship companies, this “Europa” is the fourth liner to sail under that name, each more elegantly modern than the last. Talk about a tradition of excellence. This “Europa” was immediately hailed as the world’s most luxurious cruise liner when launched in 1999, partly because the high Continental food and service standards of her predecessors were so scrupulously maintained and partly because although the same size, she was built to accommodate 20 percent fewer passengers (ship space per passenger being a big factor in luxury cruise ratings). Other factors were the technical advances she introduced. For example, the “Europa” was one of the first cruise liners to feature an azimuth thruster propulsion system, with its propellers powered by electric motors mounted outside the hull on pod units that can rotate 360 degrees. This both reduces the noise and vibration throughout the ship, but also lets the captain steer her through tight places and slip up to and away from piers unaided by tugboats, the equivalent of pulling sideways into a tight parking space. All of which makes for a distinctly quieter, smoother sailing experience. Yet because German is the primary language on all four Hapag-Lloyd cruise ships and German-speakers comprise the vast majority of both the “Europa’s” very upscale passenger lists (over 40 percent are repeat customers, many of whom have tallied over 300 nights on board) and crew members, she does not attract as much attention on this side of the Atlantic as other upscale vessels. But language issues aside, what do these all luxury rankings really mean? How good can good be? There’s only one way to discover for sure. That’s how my wife Sari and I found ourselves in the sunny Spanish city of Barcelona boarding this nautical nirvana for a five-night voyage to Casablanca, Morocco, with day-long port calls in Valencia, Cadiz, and Portimao, Portugal. It’s hard work, but somebody has to do it. Small in comparison with modern mega-liners, the “Europa” offers a mere 7 decks to its passengers, allowing for a relatively intimate, personalized experience reminiscent of being a guest on a private yacht. Conducted directly to our cabin by the charming young woman from Dusseldorf who was to be our concierge for the voyage, we found our luggage already waiting for us. Right then, I knew we were in for a treat. Although on the lowest cabin deck and among the smaller on the all-suite ship, our cabin was remarkable by any comparison I could make. Elegantly appointed and surprisingly spacious, with separate sleeping and sitting areas, a huge, walk-in closet and a large, marble-lined bathroom with both a stall shower and full-sized bathtub, it was more like a room in a luxury hotel than any of the nearly 20 cruise ships I have sailed on. In-room entertainment included a selection of TV channels and movies, but not surprisingly, most offerings were in German. In addition to a phone, the free e-mail proved handy (although Internet access was quite costly), and a mini-bar stocked with complimentary beverages, including beer. But the cabin’s best feature was our private veranda open to the sea relatively close to the waterline. As enticing as the “Europa’s” many other amenities proved to be, we were often inclined to spend ship time sitting there sipping coffee or wine, reading, talking and watching the waves roll by. For my money, the peace that comes with that privacy may be the most precious luxury a cruise ship can offer. As attraction abundant as modern mega-liners have become, enormous vessels bristling from stem to stern with an amazing array of entertainment and recreational opportunities, quiet space can be elusive, especially so close to the sea. This is not to imply the “Europa” lacks for activity options, only that they tend to be understated. Since wellness is an underlying theme, there are plush fitness and workout rooms, a large, long pool with a retractable roof where one could swim laps in any weather, and a golf simulator for those so inclined. The ship’s large spa features a comprehensive array of treatments, and a very upscale boutique and jeweler’s shop offers diversion for those who don’t get enough shopping during day-long shore excursions. But while there is no climbing wall, ice skating rink, cineplex or even a casino, the ship’s hospital is one of a few in the world with an on-board dialysis unit. However, because of the ambitious itinerary, which gave us full days to explore three charming cities at our own pace and interest, much of our ship time was spent sleeping or eating. I’m pleased to report both of those activities were 5-star experiences. The quiet comforts of the cabin and silky smoothness of the ship made for restful dreams, which can elusive at sea. And from morning coffee to late dinners, the dining was superb, living up to the “Europa’s” superlative ratings and served in one’s choice of four wonderful venues. The main “Europa” dining room can accommodate the entire ship at once and yet offers elegant, multi-course, à la carte dining, while the smaller “Oriental” and “Venezia” provide more intimate meals. All had a Continental formality. Breakfast and lunch were casual, but jackets and ties were suggested for men at dinner, and one evening most guests wore a gown or tux. The Lido Café on the upper deck was the place for more casual consumption indoors or out any time of day. 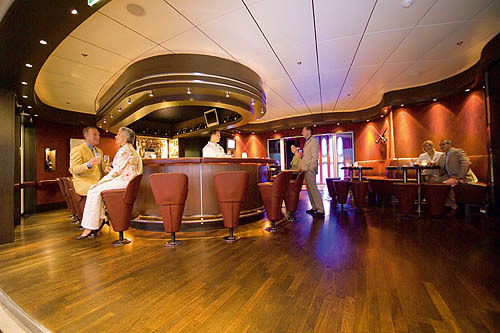 The Sansibar an open aired bar aft proved a popular after dinner meeting spot. Wherever we chose to raise a fork or glass, the wait staff was simultaneously attentive and discrete, and every morsel or drop that passed my lips during those five days was delectable. Yet because everything was of the highest quality, exquisitely prepared and presented in portions that were small but satisfying, I felt less of an urge to over-indulge than many other cruises I’ve taken. As far as the language issue, most of the ship’s daily life is conducted in German (which I speak somewhat). While key communications, signage and printed materials generally offered English translations and most staff and many passengers spoke at least some English, other activities, from most shore excursions and afternoon lectures and evening entertainments (our cruise happened to have a big-band theme featuring two groups, the Vienna Dixie Cats and a straight-up jazz combo), were conducted almost completely in German, as would be expected in consideration of the vast majority of the passenger list. So although language was not a particular problem, it definitely was a limiting factor. I’d have to concur with the experts. The “Europa” certainly does provide cruising at its most luxurious, especially for wealthy, worldly travelers who are looking for a relatively intimate and decidedly authentic European experience. The “Europa” cruises the world’s waters throughout the year, with specific sailings that range from 3 to 24 days and start at about $1500 per day per couple.